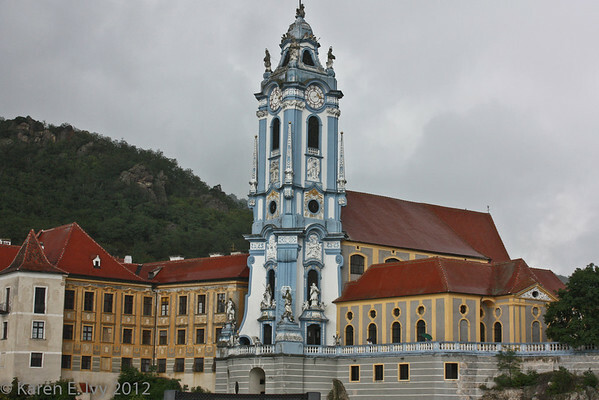 Having left Melk Abbey around noon, we sailed on down the Danube toward the Wachau Valley. 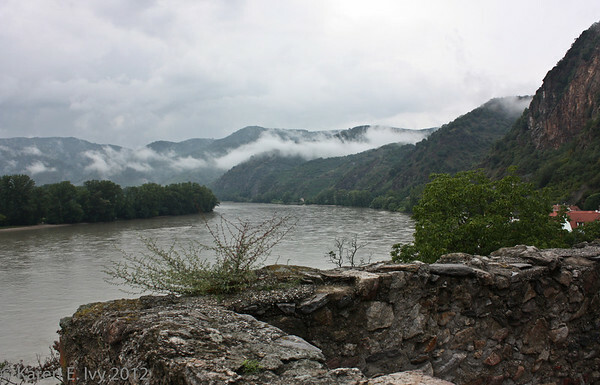 This was the first day we had had unfettered access to the soi-disant “sun deck,” and of course it was overcast, although by the time we set out the rain which had poured down on Melk had slacked off. 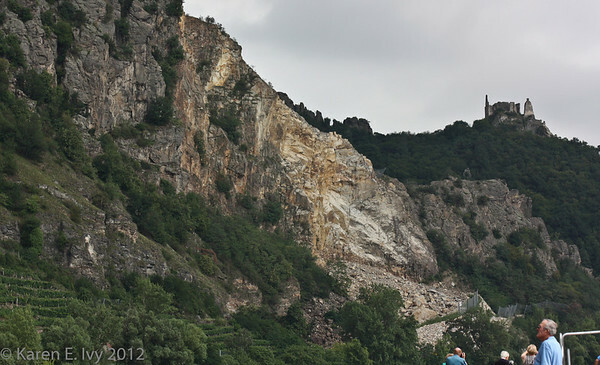 As usual, this post includes some but not all of the photos I took that afternoon; you can find more of them at the gallery Dürnstein and Wachau Valley. You can also see larger versions of anything in the gallery. 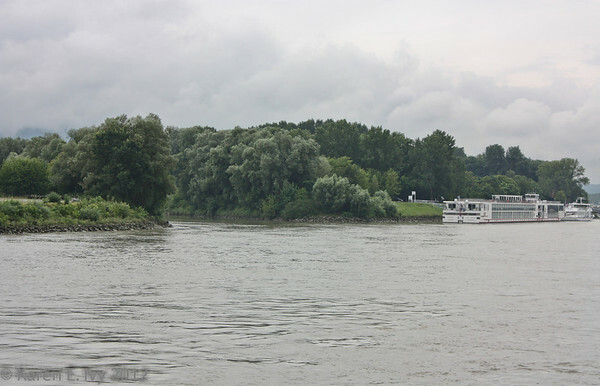 At this point the Danube flows through hilly country which looks very much like the Rhine Valley, so I climbed up on the sun deck to see if I could take some photos of castles. Here’s the only one I got, Ruine Hinterhaus above Spitz. You can see a little bit of Spitz at the bottom of the hill. 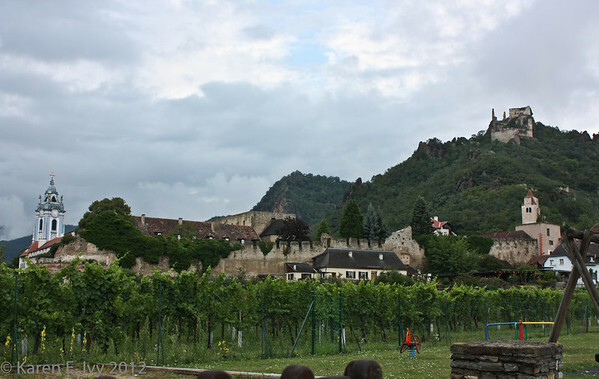 Notice the vineyards coming down the entire side of the hill, starting just below the remains of the castle. If you read German (or can stand Google translation), the Deutsche Wikipedia article on this site is interesting. This building was first mentioned in 1343, and the vineyards are said to have produced “a certain amount of grape harvest” every year. 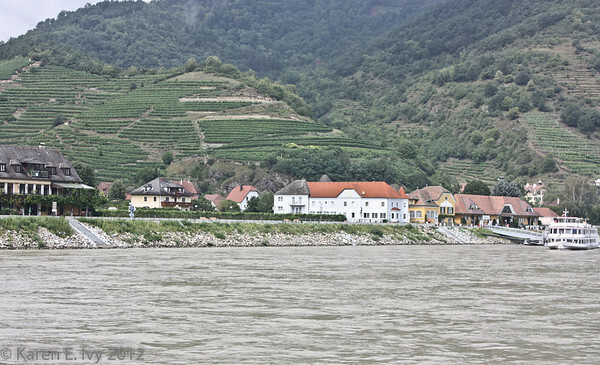 The Riesling grape variety is said to have originated near hear. Even better, the castle is haunted: the spirit of Adelhard, wife of one Henry the Iron (Heinrich des Eisernen), appears every year in the “back house” on the anniversary of Henry’s death. Apparently Henry remarried shortly after Adelhard died, without observing the mandatory year of mourning, and his death was considered a punishment for his “shameful behavior” (“schändliches Verhalten”). I haven’t been able to find any details about “Henry the Iron.” The Ruine Hinterhaus is also an inn, if you’d like to stay and possibly meet Adelhard’s ghost. 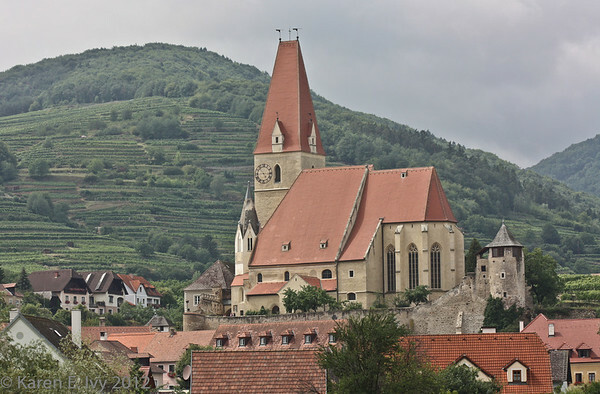 I was interested in the Wehrkirche St. Michael (fortified church), a little farther down the Wachau Valley. 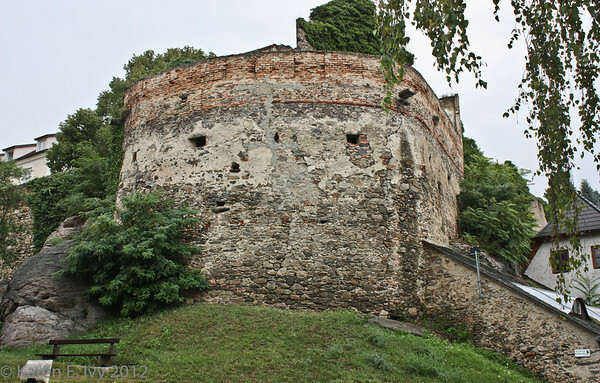 You can see the fortifications, the round defense tower and battlements. The original church dates to the 10th century, the fortifications to the 15th. 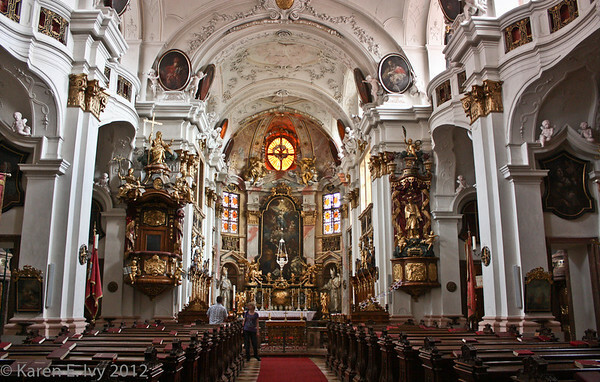 On the site austrianlegends.com I found a charming description of the church’s history and a legend about how the seven stone rabbits came to be on the roof of the nave. Now, I never noticed any rabbits on that photo; but after reading this I went back to my photo gallery and expanded the photo below to full size, and by gum, there are the 7 rabbits! 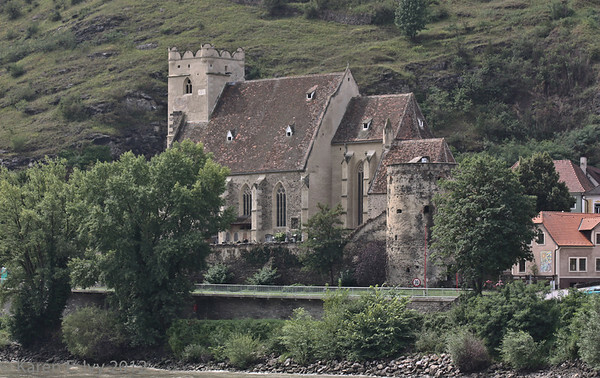 You have to go to the gallery, Dürnstein and Wachau Valley, find the photo, and expend it to “original” size – then you can see the rabbits sitting on the nave, which is the middle section of the roof. No cute legends about this church, but the town seems to be a tourist center, and if you want a 4 star hotel they have one. 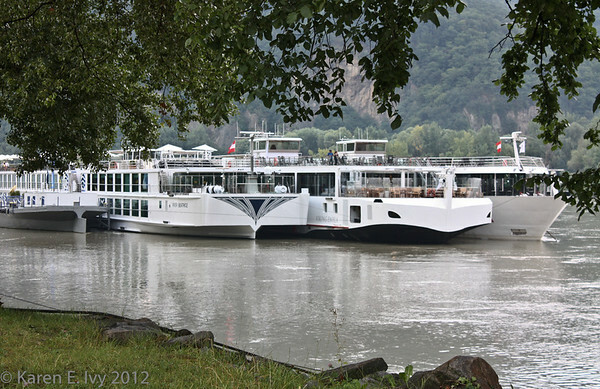 Around 3:30 we docked at Dürnstein, in a 3 ship sandwich – Embla is in the middle with a ship on either side. We had to walk through the close ship to get to and from shore; and the unfortunate passengers on the outside ship had to walk through two ships to get in and out. This was not the only place we were stacked out like this. Here’s a nice dramatic view of Dürnstein Castle from down the river, followed by a closer view taken from shore with a telephoto. That isn’t a crack in the top right section; that long straight line is probably an electrical wire. If you go to the gallery and blow the photo up to Original size, you can see more electrical wires. Yup, they illuminate the place at night. No, I didn’t get a shot of it. 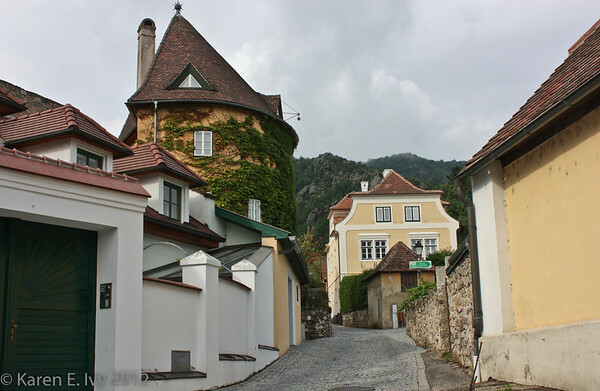 Why do we care about Dürnstein Castle? Gather around, romantics all, while I tell you a tale of medieval idiocy – which you’ve probably heard. 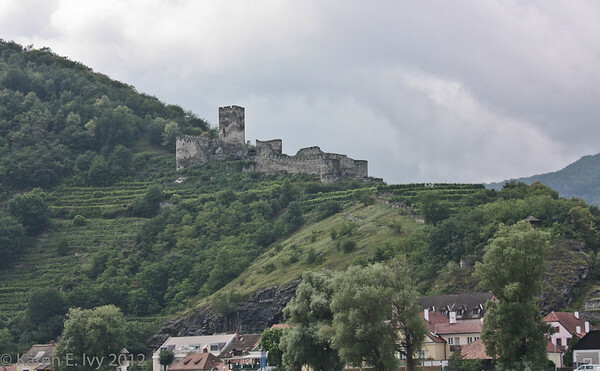 Dürnstein Castle is where Richard the Lionheart was kept prisoner for part of the 2 years he spent locked up in Germany. The details – many details – are in the Wikipedia article I’ve linked. Briefly, in 1191 Richard went to the Holy Land on the Third Crusade, where he managed to piss off both his allies and Saladin, his opponent. The Third Crusade didn’t work out well for him, and in his absence both his brother John and Phillip of France were taking advantage of him in properties that he owned. At that time the crown of England owned quite a bit of France; Richard’s mother, after all, was still Duke of Aquitaine in her own right. Richard started to sail home but his ship was wrecked and he had to travel overland; near Vienna he was captured by Leopold V, Duke of Austria (one of the allies he had annoyed), who locked him up in Dürnstein. He spent about a year there, then was handed over to Henry VI, Holy Roman Emperor, who was also annoyed with him, and who locked him up in a different castle. Richard’s mother, Eleanor of Aquitaine, and his brother John, acting as regent, scraped together the ransom of 150,000 marks (65,000 pounds of silver), which was something like 2 to 3 times the annual income of the English Crown at the time. They imposed a tax of the quarter of the value of property on both clergy and laypersons, plus other taxes. If you ever wondered why English history hates evil King John, this is why – how would you like to come up with 25% of the value of your property in cash? John was actually a pretty good administrator; Richard was a terrible administrator. His only interest was in going off and being a hero. John and Phillip of France offered the emperor 80,000 marks to keep Richard locked up until the end of September 1194, but the emperor turned them down and Richard was home in late February. And John’s reputation never recovered from the taxes needed to bail out his adventuring brother, the King. 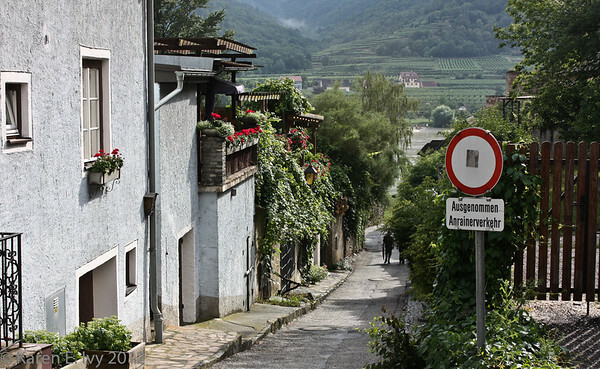 I didn’t feel up to walking up to the castle so I wandered around the town alone. I started at the first thing you come to when you walk up to town from the boat dock – the city wall. The Wikipedia article on Dürnstein the town doesn’t say anything about how old the wall is, but the town was first mentioned in 1192 (see facts above); it’s possible but unlikely that the wall dates from the 12th century. Looks a little battered, doesn’t it? 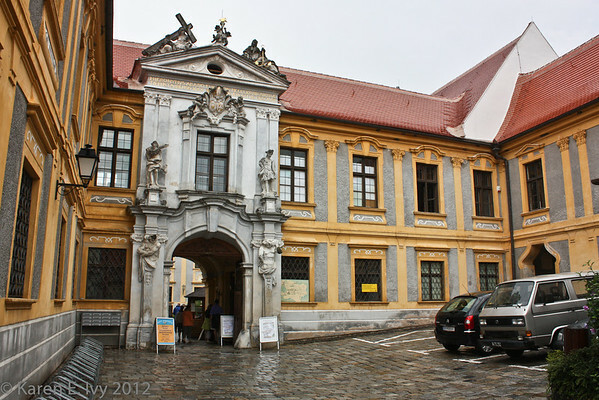 In fact, the whole place seems to have been spruced up in the 18th century, including the courtyard, now a parking lot. 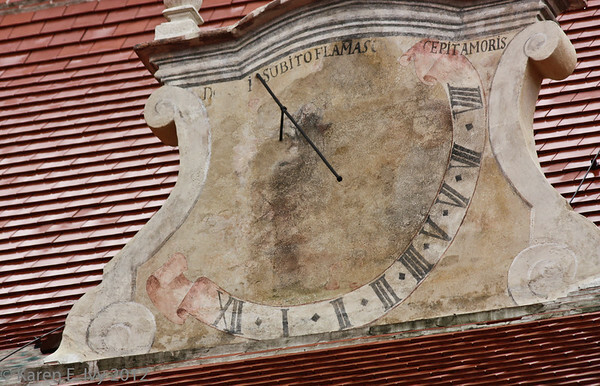 In fact, the courtyard held not one but two copies of the weirdest clock I ever saw. Really, could you tell time by this?? And two of them. The other one was in better condition but didn’t have the motto. 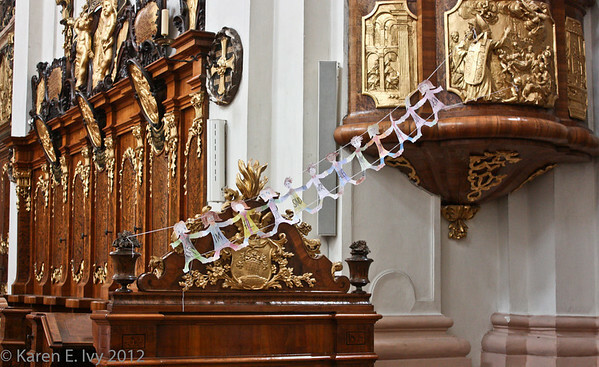 I was totally charmed by the string of paper dolls hanging on one side. A church with children is a real church. Walking around the rest of the town, I saw the usual shops, heavily tourist oriented. 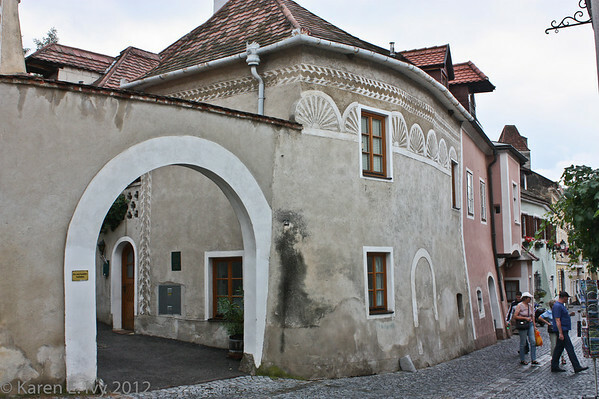 The burghers of Dürnstein have some nice painted designs on some buildings. I don’t know what this is, or was, but the arch into a courtyard suggests it may have been an inn. Just my guess. The biggest hotel in town, which almost certainly was an inn, has got (of course) the best view down the Danube; Dürnstein is located on the outside of a bend in the river. This is the view from the terrace in front of the hotel. Along the right edge you can just see the roofs of the non-tourist part of town. The river is very much right there in Dürnstein. Here’s a view down one of the streets leading to the waterfront. You can get a glimpse of the valley on the other side of the river. I’ll end with a view of the whole town, from the castle up top, down to the Abbey Church. You can see the town wall, going all the way back to the second building with the tower. If it continues up to join with the castle walls, it’s hidden by the trees; but that would have been normal then. 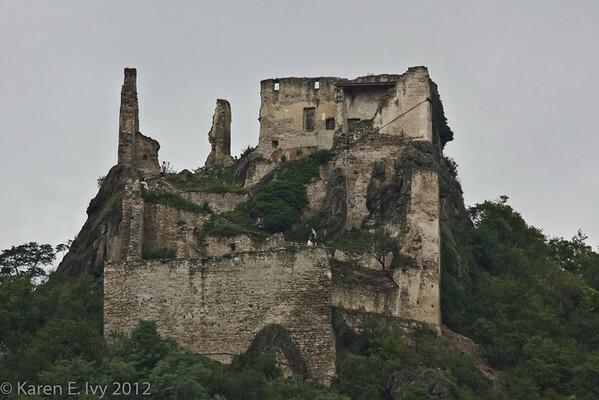 Towns along the Danube had to be fortified, as well as castles.